Home » Blog » How to » How fast is Frontier Wireless Internet Connection? Frontier Wireless Internet has made it possible to have multiple devices connected to the internet simultaneously. And without any wired connection. Therefore, you can connect your device from anywhere where your device can catch the wireless signals. You can video call your sibling in another state on one device. And can stream the recipe of fettuccine pasta on another, simultaneously. Or, indulge in a fun, hashtag conversation while downloading heavy multimedia on another device. Let’s explore the features offered by Frontier a little more in detail. What Services Does Frontier Provide? Frontier communications provide DSL, wireless, FTTH (fiber internet), and so on. They have managed to cover the areas, which are often neglected by other ISPs. The more this provider grows, the more internet access is ensured for the people. Especially those residing in remote and rural places. They also make sure that these users get the same high speeds, which the urban users get. So much so that they provide up to 1 GB to suburban areas. 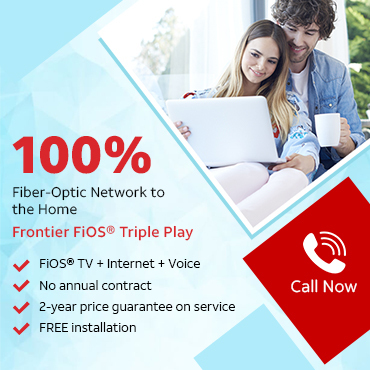 Most of the FiOS Internet plans do not require any term agreement or contract. This is one of the most preferred qualities in any internet package. The second best feature is that they have no data volume restrictions. It is safe to say that it is definitely one of the best internet providers out there. Frontier wireless internet speed is the best feature. It is symmetrical. Meaning that the uploading and downloading speeds are the same. Unlike other ISPs, who offer different upload and download speeds. It’s actually a tricky marketing hack. They advertise a whopping downloading speed. And pair it with an essentially weak speed. Most of the users fall prey to this well-orchestrated advertising hack. Little do they know that the uploading speed plays the central role! Especially in uploading heavy multimedia! Users who have to upload things often should be aware of this. But Frontier wireless internet doesn’t aim to fool with their prestigious clientele. Frontier Packages – How to Choose the Right One? Considering all these factors will help you make the right choice. Have you ever subscribed to an ISP with a data cap? Have you experienced having additional charges? If yes, you would know how quickly the expenses just keep adding up. Giants of the ISP industry do not offer the free-range Internet approach. But, Frontier does. Imagine, you can always watch HD videos and enjoy online gaming. You can download heavy multimedia, watch Netflix, and browse social media. And that too without having to worry about the data left. And more importantly, the extra few hundred bucks, which are going to add up to the basic billing schedule. The contemporary customers of this Internet age don’t expect and like the kind of data restrictions that ISPs are giving them. With Frontier wireless internet, you are free to use as much internet as you like. The internet packages should be facilitating. Instead of forcing customers to be conscious of their internet use. Why Go for Frontier Wireless Internet? Frontier provides its efficient customer support Monday to Friday. The customer care department has managed to win a massive clientele over the year. Which is why Frontier is rated above average in the department of customer care. In 2015, Frontier managed to earn a score of 64 from the prestigious American Customer Satisfaction Index. If you conduct a survey, you will know that the customer care representatives at Frontier are approachable and helpful. The phone agents promptly handle all the queries and concerns. In a nutshell, we got to give the due credit to Frontier for having something for everyone. It offers reasonable pricing, a massive service coverage area, a good range of speed options, and no data caps. You have the liberty to browse and choose the best package for yourself. You can further customize it too as per your preferences. And if you are looking for a cable TV provider or a home phone service, you can go for easy bundling opportunities. It is really convenient to enjoy all three digital services in a single bill. You don’t have to undergo the hassle of communicating with three separate digital services providers. And to scrutinize and understand the offered features of each one of them. last but not least, say goodbye to Ethernet cords and wires running all over your house. And also to drilling holes. And the tedious unplug and re-plug drill every time you want to go to another room. Because you are choosing wireless internet! Previous PostPrevious What Channel is CNN on FiOS in the Different States?